I realize Valentine’s week is not the optimal time to announce that breakfast in bed weirds me out…but it does. That is, unless Red Velvet Cinnamon Rolls are on the menu, in which case I’ll devour the entire pan anywhere you are prepared to serve it to me. Maybe it’s because I am a messy eater, but the thought of toast crumbs and buttery fingers in the intimate vicinity of my pillow seems odd. Don’t get me wrong, the idea of breakfast in bed is completely luxurious and romantic: gently waking to a lovely spread of flakey biscuits, orange marmalade, and piping hot coffee, all served on antique china set atop a lace doily, all delivered to my bedside? Swooooon. Heaven forbid I should exert myself with anything as strenuous as standing up or (gasp!) brushing my teeth. Breakfast in bed does look pretty fabulous on Downton Abbey—but then again, Lady Mary isn’t the one washing the sheets. Red Velvet Cinnamon Rolls, however, are one breakfast I fully endorse eating in bed. They are of a special caliber of ethereal decadence that merits the occasion. I vote we embrace our inner aristocrats, and go for it—provided our inner aristocrats are permitted to lick the cream cheese frosting from our dainty fingers of course. 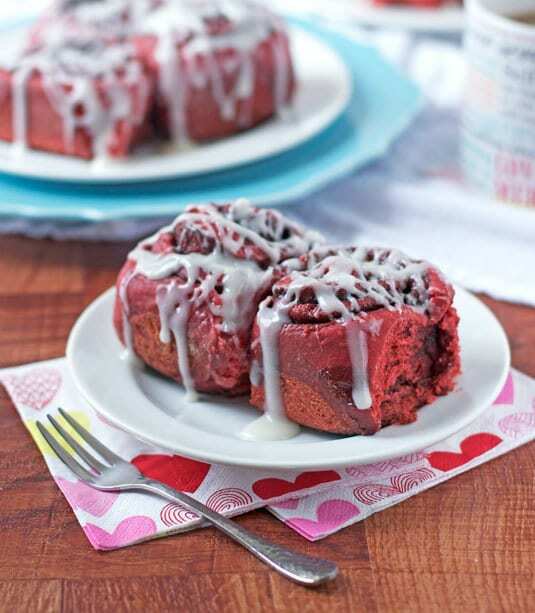 Red Velvet Cinnamon Rolls combine the fluffiest, most gloriously ooey-gooey cinnamon roll of your life with the classic flavor of red velvet cake. 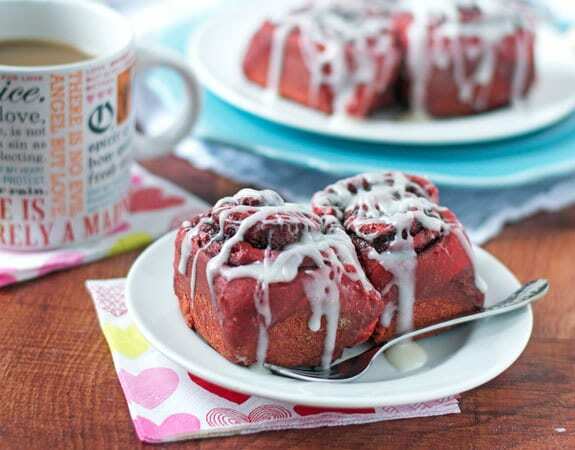 To qualify as real-deal red velvet, a recipe demands both buttermilk and cocoa powder, both of which are present in these Red Velvet Cinnamon Rolls. Buttermilk is ideal for keeping the dough extra tender, and the cocoa adds a subtle chocolate flavor to both the dough and the cinnamon-sugar filling. I’m not sure if cream cheese frosting is absolutely positively mandatory for red velvet cake, so I decided we should slather it on as a precautionary measure. Safety first. Inappropriate Valentine’s Week Confession #2: I’m not a huge fan of red velvet cake (a life-long struggle I divulged in full detail here), mostly because I typically spend my entire time eating a slice of red velvet cake wishing it were chocolate cake instead. Red Velvet Cinnamon Rolls however, I adore. The subtle cocoa taste and moist buttermilk richness of red velvet cake is ideal for a pan of gooey cinnamon rolls, and the cream cheese frosting classic to red velvet is equally suited. Add the ruby red hue, and have a red velvet cake-cinnamon roll mash up fit for the breakfast hall of fame. 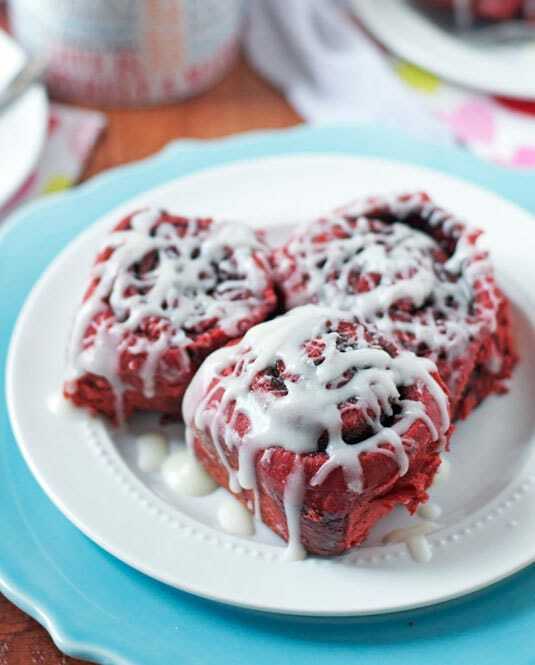 As I divulged on my FAQ page, sweet rolls with a special twist are my favorite recipes to make, and these sublime Red Velvet Cinnamon Rolls are every reason why. What isn’t to love about fluffy, sky-high buttermilk rolls oozing with cinnamon and covered in drippy cream cheese glaze? Answer: waking up at 4 am to make them. Homemade cinnamon rolls are not difficult to bake, but there is no shortcutting the hours the dough requires to rise. Rather than sitting around all morning and giving my dough the evil eye for not being ready when I was set to eat it (five minutes ago), I created this Red Velvet Cinnamon Roll recipe for overnight rising in the fridge. Make the dough and shape the rolls the day before, then in the morning simply pop your pretty red cinnamon spirals into the oven, and voila! Hot, homemade Red Velvet Cinnamon Rolls in half an hour. My other ingredient secret: Red Star Platinum Yeast, my bread-baking BFF. I bake bread once a week, and Red Star Platinum has yet to fail me. It’s reliable and creates the softest, fluffiest breads I’ve ever baked. With a bit of prep the night before, overnight Red Velvet Cinnamon Rolls can be hot, fluffy, and on your plate in half an hour + the time it takes your oven to preheat. Roll out of bed, pop your handiwork into the oven, and soak in the magic smell of cinnamon and cocoa wafting through your kitchen as they bake. Or better yet, stay under the covers and have your roommate/boyfriend/husband/impressively-trained retriever pop the Red Velvet Cinnamon Rolls into the oven, then bring them to you in bed. The antique china and paper doily are optional, but encouraged. Tender, fluffy, and ooey-gooey buttermilk cinnamon rolls with the classic flavor of red velvet cake, topped off with cream cheese frosting.This overnight cinnamon roll recipe is prepped entirely the day before, so you can enjoy all the benefits of homemade cinnamon rolls for breakfast without the wait. This recipe is truly a must for all red velvet lovers! Begin the night before. If mixing by machine: In the bowl of a stand mixer, whisk together the eggs, egg yolks, sugar, butter, food dye, and vanilla extract. Add 2 cups flour, cocoa powder, yeast, and salt. Place buttermilk in a microwave safe measuring cup and microwave for 30 to 45 seconds, until it reaches the temperature required for the yeast. (Refer to the package directions for the specific temperature—Red Star Platinum is 120 to 130 degrees F). If the buttermilk curdles when heated, simply whisk it back together. Pour the heated buttermilk into the mixing bowl and stir by hand or with the mixer’s paddle attachment until the ingredients are evenly moistened. Switch to the dough hook, then add the remaining 1 3/4 cups flour. Knead dough on low speed for 6 minutes. The dough should be soft, moist, and tacky, but not excessively sticky. If dough is too wet, add more flour 1 tablespoon at a time, until the correct texture is reached. Lightly spray a large, clean bowl with cooking spray, then transfer dough to the bowl, turning once to coat. Cover bowl with plastic wrap and let rise in a warm, draft-free place until doubled in size, 2 to 2 1/2 hours. If mixing by hand: Stir the ingredients together in the order above with a wooden spoon for several minutes, until the dough forms a wet, shaggy mass. Turn dough onto a floured surface and knead for 5 minutes. The dough will be very sticky and cling to the counter, but use as little flour as possible to prevent the dough from becoming tough. Once kneaded, scrape the dough into a lightly oiled bowl, turn once to coat, cover with plastic wrap, and let rise. Prepare the filling: In a small bowl, combine the brown sugar, granulated sugar, cocoa powder, cinnamon, and salt. Set aside. Melt butter and set aside. Shape the rolls: Butter a 9x13-inch ceramic or glass baking dish. Turn the risen dough out onto a lightly floured work surface and roll into a 18-inch by 12-inch rectangle, with the longest side closest to you. Brush the dough with melted butter, then sprinkle with the brown sugar-cocoa powder mixture. Starting with the long edge, roll the dough tightly into an 18-inch log. With a a sharp, serrated knife, gently saw the log into 12, 1 1/2-inch wide pieces. Arrange the buns in the prepared baking dish, cover with plastic wrap, and refrigerate 8 hours or overnight. Bake the rolls: The next day 30 minutes prior to baking, remove rolls from refrigerator and let come to room temperature. Place rack in the center of oven and preheat to 350 degrees F. Bake rolls until they are puffed and darken slightly and the internal temperature reaches 190 degrees F, about 30 minutes. Check the rolls 20 minutes into baking—if they appear to be browning too quickly, cover the pan with aluminum foil, return the rolls to the oven, and continue baking until complete. Remove the pan from oven, uncover if necessary, and place the pan on a wire rack to cool slightly. Make the glaze: In a mixing bowl, beat the cream cheese until smooth and creamy. Add the milk and vanilla extract and whisk until combined. Slowly mix in the sifted powdered sugar until smooth. Drizzle over warm rolls and serve immediately. Rolls are best enjoyed the day they are baked but will last up to 4 days well wrapped in foil at room temperature. Reheat in the microwave before serving. Alternatively, you can tightly wrap and freeze the rolls for up to 1 month. Thaw in the refrigerator or at room temperature, then reheat in the microwave immediately prior to serving. Looking for more bread baking tips? Check out Red Star Yeast’s helpful videos and baking tips, along with everything you need to know about yeast. For recipe ideas and inspiration, follow Red Star Yeast on Facebook, Twitter, Pinterest. Red Star Yeast compensated me for my time to create this recipe and post, but all opinions are my own. Okay, I am SO happy to find someone that also does not adore red velvet. I just can’t get into it and I thought I was the only one on planet Earth! Pretty sure that the cream cheese icing is definitely mandatory. And, mandatory to slather all over my face and on these amazing rolls! I think I may just come to love red velvet with these babies. You can hate me, but I totally want to make you my red velvet cupcakes and force you to like them. Sorry lol. PHEW! Glad to know I’m in the clear, and I had NO IDEA Red Velvet was intended for Christmas in the South (I’m a true Midwest girl and this lack of info proves it.) I would LOVE to taste your red velvet cupcakes! You may make a believer out of me yet. Tina and I will educate you on southern ways, don’t you worry. I’ve got just enough southern in me to bridge the two regions and make us the perfect trio. :-) Also. Is it wrong to admit now that I have no qualms with eating any and all meals in bed? Oops. 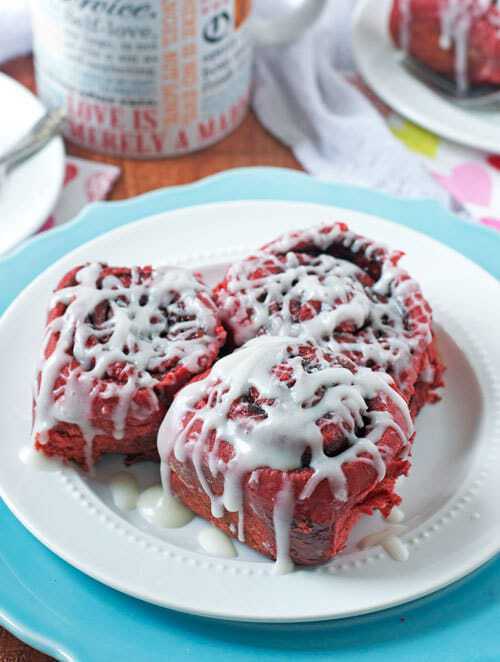 Red Velvet cinnamon rolls are a BRILLIANT idea! I do love red velvet cake, at least the red velvet I had from a church caterer once – I have yet to try my hand at it! I think I might try these rolls first though! I feel the same way about breakfast in bed, but I’d totally make an exception for these. I adore red velvet anything! These are soooo pretty! The perfect Valentine’s Day treat :) Great blog!! Awwww thanks Jenny! I love your blog, so that means a ton. I’m blushing :) Happy Valentine’s Day! Ha, I’m with you, I never want to eat in bread. I don’t want crumbs everywhere! I really love these, Erin. They are the biggest, thickest rolls I have ever seen! The red velvet is beautiful! These look amazing! Perfect for V-Day! I would love this If I was not the one making it on Valentines day..And how do you not like red velvet,,maybe you should visit Sprinkles Cupcakes, their icecream is even better. These cinnamon rolls are so flipping cute! What a great way to celebrate Valentine’s Day! My oldest will LOVE these. She is all about red velvet! My hubby loves it too, but he isn’t in love with delicious sweet breads like the rest of the world. Oh well. More for me! :) Thanks, Erin!! I’m starving! These look gorgeous! LOVE the Downton Abbey analogy! P.S. I don’t like breakfast in bed either. So THAT’S where I get it, lol. Breakfast in bed attitude–it’s hereditary. I couldn’t wait to see these after your teaser on facebook! They look so great Erin. I’m obsessed with RV, but my husband doesn’t really care for it either! Recipe pinned! I adore cinnamon rolls and love red velvet so this is a winning combo! You are brilliant! Overnight cinnamon rolls?! Done. I agree with you–I would much rather be eating chocolate instead of red velvet. Except when it comes to these. Because they look amazing. And that cream cheese glaze. Ohhhh so good. Love these, Erin! The cream cheese frosting is EXTREMELY necessary Beth! Our apartment is so small, the distance from the kitchen didn’t occur to me, lol. Another good point though! Though I am not a fan of food using colouring, I will certainly make an exception for those cinnamon rolls. They look very delicious! These are perfect! The perfect red, the perfect frosting, the perfect everything! Those look so so good. I never thought to use red velvet in this way. Must try! These are so perfect for Valentine’s day! So, I am also not a fan of red velvet (Eeek). To keep with the spirit of the holiday, I was planning on making RV cupcakes for my coworkers to enjoy during our weekly staff meeting on Friday. Then I found this recipe… my plans have changed. I am so excited to try these! I’m kind of meh about red velvet, too, but not about cinnamon rolls. ALL IN WITH THESE. Glad I am not alone Steph! As cake red velvet doesn’t speak to me, but in cinnamon rolls? It sings my name in opera!! i’m not a big red velvet girl myself either. love the sound of these cinnamon rolls! I’d love to say that I don’t eat in bed, but that would be a lie. I eat in bed every single night. Well, I snack. I’m usually sleeping in pretzel crumbs. It’s so gross; I know it is. These rolls are a pile of red, fluffy gorgeousness. Pinned. Haha, I love the idea of breakfast in bed, but not the reality as much. Breakfast in pjs, but not in bed – that’s my style :) I love all cinnamon rolls intensely, and these look no different! haha I tried to eat toast once in bed and it ended in me sleeping among crumbs for far too long (since I hate washing sheets and put it off as long as possible, gross I know). Never again. But I would happily get out of bed to eat one of these cinnamon rolls! I love red velvet so these are right up my alley! My guys LOVES red velvet. I may have to try to whip these up for hip Valentine’s Weekend! This looks DELICIOUS. It’s my favorite cake in the form of a cinnamon roll! I really wish downloading food existed! Tiffany, that would be the greatest invention of all time. If you hear of anyone working on it, let me know. I’ll mail them some cinnamon rolls to help with the effort! Every day you remind me exactly why I adore you – you make red velvet carbs slathered in sauce. Heaven!! Megan, this is quite possibilty the best compliment I have ever received. BLUSHING!!!!! This sounds amazing! I really need a cinnamon roll right now! Yes you do Julianne!!! Why fight the urge? Oh my gosh – incredible! More often than not I wake up famished, so my cinnamon roll plans are usually dashed by the rising time. Overnight rising is just what I need! And I’m with you on not digging breakfast in bed. Any relaxation there is to be had is totally negated by worrying about crumbs, butter grease, coffee drops, etc. Holy cow. I can’t even put into words oh delicious these look. I’m always trying to find new ways to make cinnamon rolls since my husband is OBSESSED with them, these have GOT to be our morning after Valentine’s breakfast. These are gorgeous! And I love cinnamon rolls, now I’m in the mood to make some! These are some gorgeous cinnamon rolls! Love the color – so fun and perfect for V-day! What gorgeous cinnamon rolls! I too am not a huge fan of red velvet, but I could definitely, definitely find my way to eat more than a few of these!! Sweet rolls are one of my favorite treats ever! And I’m not the biggest fan of red velvet either, but darn, girl, you made these babies look real good! And yeah breakfast in bed = no cool. Crumbs everywhere… it’s like sleeping on a bed of sand eewww. LOVE Red Star Platinum yeast!!! These are so fun and festive! I’m not a huge red velvet fan, but I’m pretty sure you just made me intrigued enough to want these!!! Now I want these cinnamon rolls in the morning!! ;) Think my husband will get the memo? These are so fun! I’m not crazy about eating breakfast in bed either. 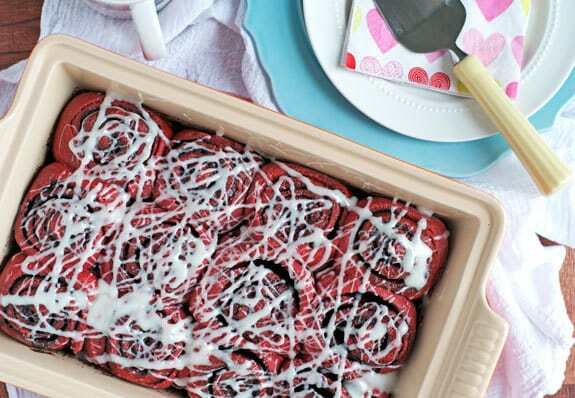 Hi, I found this- I was wondering if i could make my husband a red velvet cinnamon roll cake- kind of like sally’s addiction cinnamon cake but with red velvet. Is there anything I need to modify or i still can do that? One question? I normally use my breadmaker to make my dough. Could I edit the recipe to make the dough red velvet? Would you recommend it? Great question, but I’m afraid I don’t know if I can help you—I’ve never used a bread machine, so my sweet roll recipes are just not designed that way. I think your best bet would be to find a buttermilk dough that has a flavor and consistency similar to a sweet roll (maybe brioche though it is not exactly the same), and see if you can tweak it by adding cocoa powder and red color if you like. I wish I could advise you more closely, but unfortunately it’s just not an area I’m familiar with. Correct me if I am wrong but when using Instant yeast you usually do not have to wait 2.5 hours for the bread to rise. In my experience with it I usually don’t have to wait more than a half hour. Maybe its just me? Or are you allowing the rolls to rise completely in the fridge? Rachel, as far as I know “instant” yeast refers to how the yeast is activated (you put it in with the dry ingredients vs. activating it separately in the water). Whenever I’ve used it, I’ve needed the amount of time specified (2 1/2 hours in this case) for the first rise. “Quick rise” yeast will be shorter. That said, your kitchen or the brand you use may be different than mine. The first rise is at room temperature, and when it doubles, it’s good to go! I can’t find the Red Star Platinum yeast anymore in the grocery store. Have you still been able to get it? Love your Red Velvet Cinnamon Rolls! We can’t wait try these Rolls! You have used kitchenaid stand mixer to mix eggs, egg yolks, sugar, butter, food dye, and vanilla extract. I live in Indonesia and want to purchase kitchenaid stand mixer. Please tell me, what is Official kitchen aid website in Indonesia? Hi Robert! I’m not sure since I don’t have access to the Internet in Indonesia, but here the website is KitchenAid.com. I would try that and see if you are redirected. You can also purchase stand mixers at other online retailers such as Walmart.com, Amazon.com, and Target.com. Thanks, but Walmart& Amazon don’t have their website in Indonesia. I want to pay in Indonesian currency not in USD. Hi! Love this recipe! I was about to give this a try but I only have Hershey’s Special Dark dutch cocoa in my pantry. Will this work for this recipe? Hi Melanie, I think that will be fine. Enjoy!